IG Design, formerly International Greetings, is one of my biggest investment mistakes—even though I made a few quid on it. Since I sold my shares in International Greetings—as it was called then—in April 2014, the company’s share price has risen from 71p to nearly £5.00. Clearly I misjudged the prospects of the business and that led me to miss out on a 600% return, a little more if you count dividends. Design Group, as it prefers to be called, designs greetings cards, gift wrap, gifts, stationery and paper bags. It sources products from other companies, or manufactures them in factories in the UK, China, Poland, Holland and the USA, and distributes to retailers around the world. It focuses on high volumes of cheaper products, churning out a billion metres of giftwrap in 2018, which, were we to put the laws of physics aside, would be enough to lay a trail to the moon and get over half way back. A typical Design Group product sells for less than £2. Design Group would make a good case study in a book of boom-bust businesses. Under founder Anders Hedlund, it expanded rapidly in the decade between 1996 and 2006 but the company floundered during the financial crisis. 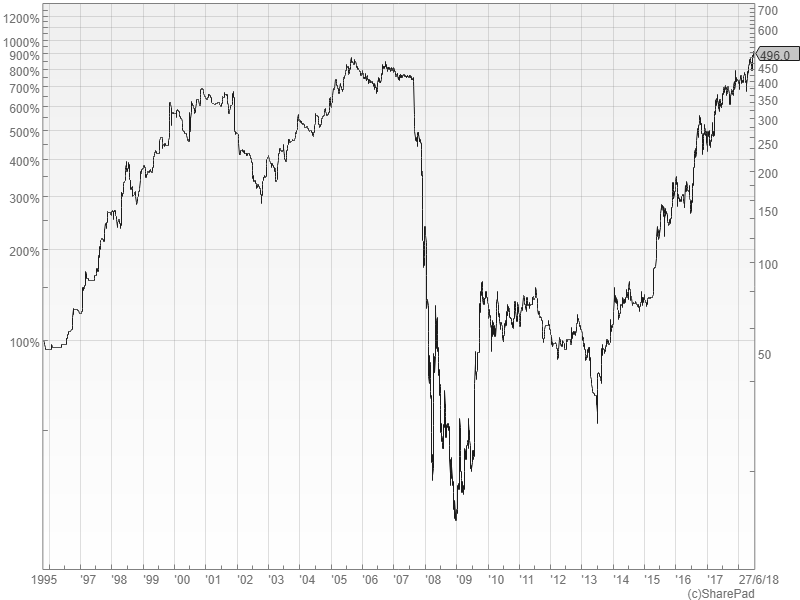 Its share price, which had risen by a factor of ten, collapsed to one twentieth of its high point. Mired in debt, and seemingly unable to weld its disparate parts into a functional whole, the company was losing money when it promoted Paul Fineman to clean up the mess in the UK in 2008. Fineman was the owner and chief executive of Anker – a stationery distributor Design Group acquired in 2005. He became chief executive of Design Group in 2009. Hedlund is still Design Group’s majority shareholder and Fineman, who owns 7% of the shares, is still chief executive. I am sad I wasn’t a shareholder between 2014 and today, but I am very glad I wasn’t one in 2008. In 2008, Design Group was integrating many acquisitions, and trying to bring together its three businesses in the UK—gift wrap, crackers and greetings cards. Costs had spiralled out of control at the same time as the UK plunged into recession. Major customers, like Woolworths, went bust losing Design Group sales and owing it money. This chart requires a bit of explanation. It is an attempt to kitchen-sink debt and debt-like obligations to give an overall picture of a firm’s changing financial position over the years. 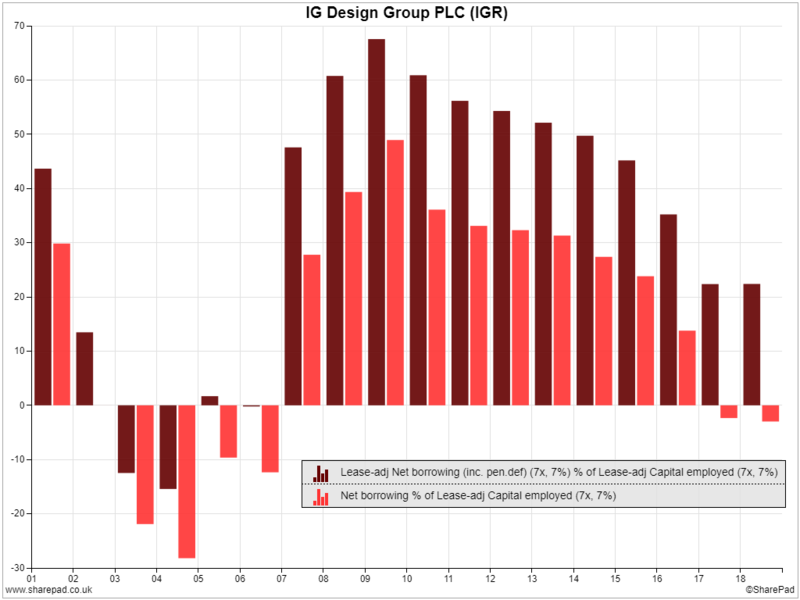 The dark red bars compare the approximate value of capitalised lease payments and borrowings to the capital required to operate the business. 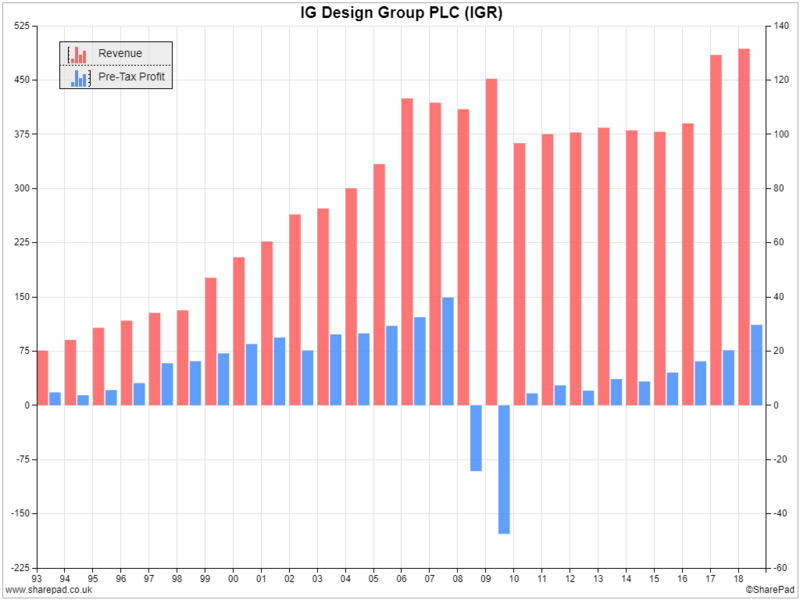 At its peak, Design Group was nearly 70% funded by external finance, and nearly 50% funded by conventional debt (the red bars). At the year end in 2017 and 2018 it had more cash than debt. Design Group’s only significant debt-like obligations were its leases. The chart shows Design Group is in a far healthier position now than it was after the financial crisis, but it doesn’t tell the whole story. Design Group’s financial year end is in March, just after its peak selling period and just before it starts gearing up for the following Christmas. It is a time when the company’s finances are under least strain: customers have paid for much of the gift wrap and crackers they sold at Christmas, and Design Group has yet to pay for the raw materials and stock that it will be starting to amass for the next Christmas. Credit to Design Group, it discloses that in 2018 average debt was 1.5 times EBITDA (a measure of profit) — about £13m in real money, enough to bring its total financial obligations back up near the 50% level on average. It doesn’t disclose peak borrowings but they could be a multiple of the £13m average depending on how much it is owed by customers because a large part of its borrowings are secured against receivables (the invoices it has raised). Design Group’s bank should understand its fluctuating financial needs but shareholders need to remember that the benign impression created by the end of year accounts is misleading, and Design Group probably shouldn’t carry much more debt. It seeks to keep average debt between 1.5 and 2.5 times EBITDA. This year it earned a return on capital employed of 20%, breaching my fairly arbitrary benchmark for a quality company of 15% for the first time since the financial crisis. Its chequered history is still relevant though because Design Group is having another go at uniting its three British subsidiaries under one management team, and it is back on the acquisition trail too. Despite the evidence of the past, this is good strategy because it needs efficiency and scale to design, source, manufacture and supply products cheaply. After Hallmark and American Greetings, Design Group is the only other global supplier with the scale to service the largest retailers, with their many requirements from bespoke design to in-store merchandising, around the World. The bigger Design Group gets, the lower its unit costs and the lower the cost, the higher the profit. That at least, is the theory. In recent times, Design Group has acquired three companies: Enper in 2014, Lang in 2016 and Biscay in 2017 (completed in 2018). The biggest—Biscay—was the most recent, an Australian greetings card supplier which Design Group could easily afford from its cash-flow. Before the financial crisis, Design Group was more aggressive. In the three years between 2005 and 2009 it acquired nine businesses, some of them large compared to its more recent forays. Design Group could lose its head and pile on the debt again, but I doubt it. The company has worked hard to plug its weaknesses and build on its strengths. Fineman has described the siloed mentality of its UK operations then, which prevented it reacting to the financial crisis, and the difficulty of integrating US acquisitions with “lukewarm” managers. When recession strikes next, Design Group should enter it stronger. I ran out of patience with Design Group. Initially, debt repayment was slow and I began to doubt whether the business was capable of paying off enough debt to weather the next bump in the road. I didn’t appreciate the company’s competitive advantage, that it is one of a few companies that can supply at scale, because at that time its burgeoning size, or at least the disorganisation it brought, looked like a disadvantage. Four years on I find myself in a familiar situation, wondering if Design Group’s enhanced prospects justify its much enhanced share price. 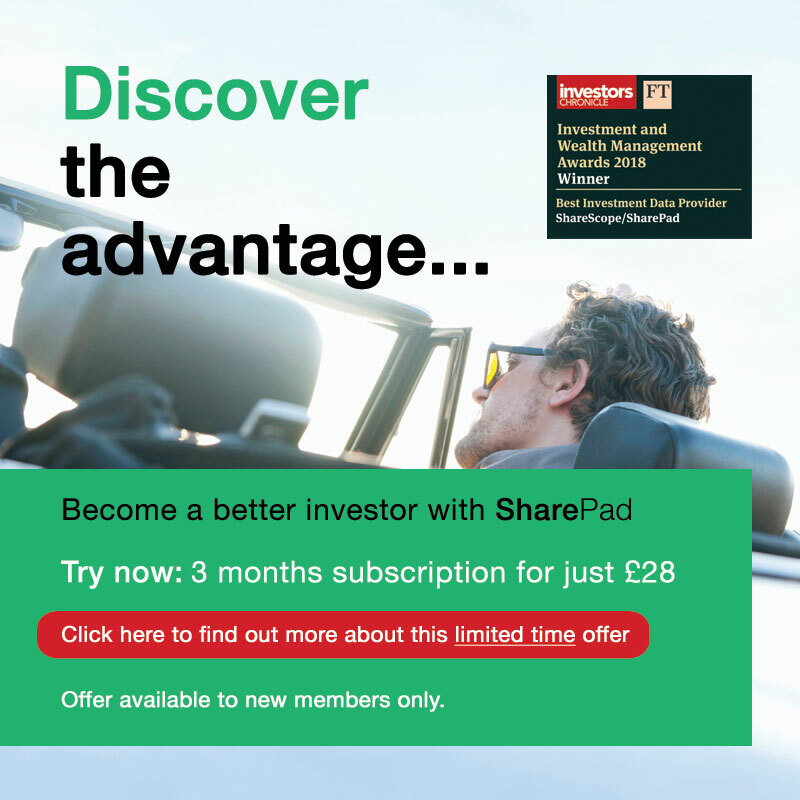 SharePad tells me the shares cost just above 21 times earnings on a debt-adjusted basis. While Design Group is in much better financial shape and its dependence on the UK has fallen from 41% of revenue in 2010 to 27% in 2018, modest profit margins of 7.5% and dependence on large retailers (its biggest customer is responsible for 8% of revenue) mean profitability could still be vulnerable in a recession. Meanwhile, it hasn’t shaken some of its earlier vulnerabilities. Though the US is now its biggest market, in 2018 Design Group derived 51% of revenue from Christmas, one percent more than in 2010. It derived 51% of revenue from lower-margin customer own brands, three per-cent more than in 2010.